Anvil Industry reminds us that bases are important, too. You can't just have your models standing on a black circle and call your figure done. So here's some new rubble bases for you. A new Anvil Gaming Base set which I debuted at SALUTE, is now available to pre-order, dispatching from May 7th. The larger pieces of lose rubble/broken brick wall shown on the 40 and 60mm bases are actually separate components on the sprue, so no two bases need look exactly the same! 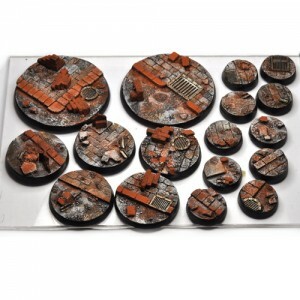 And like the other Anvil Gaming Bases, these will remain stable on almost any terrain surface.